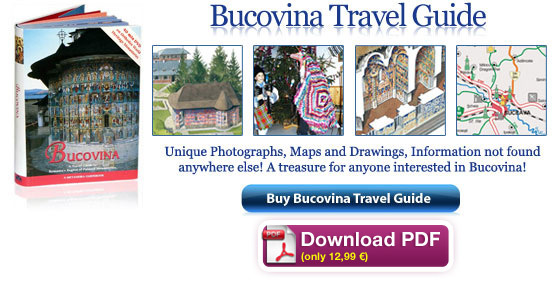 Summary: The church was built on a triconch plan, with three apses. A tower surrounded by 12 pilasters stands on an octagonal base above the naos. The open exonarthex and the pronaos are each vaulted with two domes. There is no wall between the pronaos and the naos, but a massive arch supported by pilasters separates the two liturgical spaces. 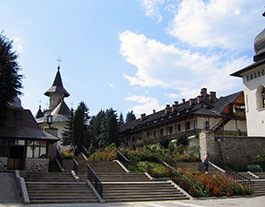 The Church of the Sihastria Monastery. 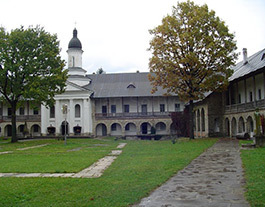 Ghedeon, former monk and prior of the Secu Monastery, Bishop of Huşi, and since 1734 Bishop of Roman, built a new church at Sihăstria between 1730 and 1734. 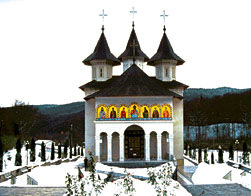 In 1821, the wooden church of Bishop Ghedeon was burnt down during the political unrest caused by the nationalistic Etaireía movement. 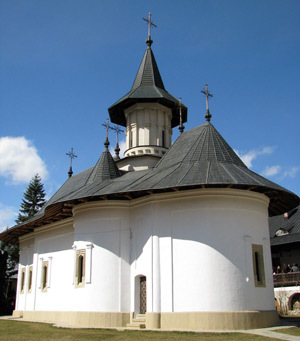 Dometian, prior of the monasteries of Secu and Neamt, raised a new stone church, dedicated to the Birth of the Holy Virgin, in 1824. The precinct walls with two towers were built at the same time. The gate tower stands in the middle of the south wall, and a bell tower is in the northeast corner. The monks’ cells and a chapel were also built in the yard. These were burnt down in 1941, and soon rebuilt. Besides the 19th century Church of the Birth of the Holy Virgin, there is a much larger church in the compound. This is the Cathedral of St. Theodora, built in 1998. The cathedral has an open exonarthex with gilded icons on the façade, and three towers. 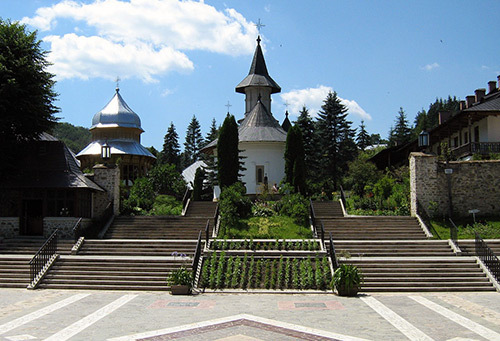 The Church of the Birth of the Holy Virgin is surrounded by the monastic buildings and the peaceful compound of Sihastria. 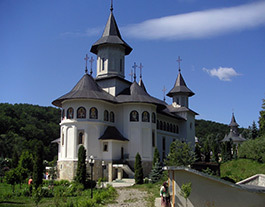 The Cathedral of St. Theodora of Sihastria Monastery.